Asansol, about 212 km away from Kolkata, is popularly known for its coal mines. The industrial city is surrounded by many coal fields. Nehru Park at Burnpur, situated at 4 km away from Asansol can be another near by place where you can go. The Main Places to visit while you are in Asansol are Maithan Dam or Mython Dam of DVC, located about 24 km off Asansol, it is a favorite place for picnics and outings. You can visit the dam, the step gardens, take a boating session at the dam waters, visit the temple on the hillock just before the dam starts, and also trek around the small mountains at the edge of the dams, which will take around 30 to 40 minutes. Overall, it is a good place to be at, especially in the winter months. Kalyaneshwari Mandir: On the way to Maithon dam, you will have to go by Kalyaneshwari temple, a very famous temple in the area. Located beside a fast stream of the bank, it is actually a Kali temple, where hundreds of devotees come everyday to offer their pujas (Worship). Lehmayer's Park or Nehru park: A few Km, away, crossing Burnpur, is Lehmayer's Park, now known as Nehru park. It is a very well maintained park by the riverside, and deserves a visit. It has its own mystic charm, and has been a favorite place for couples. There is a toy train ride too, for kids, in additions to the swings and lovely walks inside the park. 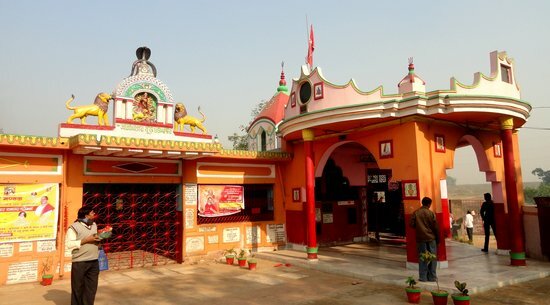 Ghagar Buri: A Shakti temple, it is located just off the bypass, near the Kalipahari railway station. Aambagan: about a km off Nehru Park is Aambagan, another favorite destination for picnic lovers. The area is known for numerous mango trees and their shades, which break off in the riverside. The river here resembles that of a mountain river, with large boulders everywhere along the course of the river. The River (Damodar) is also quite fast flowing here. Shatabdi Park: Located just off the Bus stand, is the newly built Satabdi Park, which will give you a pleasant evening. There are joy rides, eateries and a mini zoo as well. The park stretches from a plain land to a hillock. Shatabdi Park is a nice place to visit in the evenings. How to reach: It takes about 4 hours to reach asansol by bus, book a Volvo to Asansol, if you are going by bus from Kolkata. Asansol is also well connected by railway from all parts of the country. The Delhi howrah line passes through Asansol. Where to stay: There are quite a few guesthouses in the vicinity. Hotel Taj Residency and Hotel Asansol International are very expensive hotels for the quality of their services. But for others who want reasonable rates, for them the options are hotel classic, hotel Gitanjali, Hotel Maharaja etc.